The mega celebration of Cricket, Indian Premier League (IPL) witnessed its first ever Mankading in its history in the match of Kings XI Punjab and Rajasthan Royals. 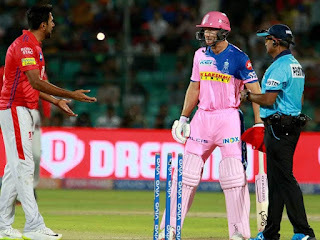 Rajasthan Royals opener Jos Buttler became the first victim of 'Mankading' in the history of the Indian Premier League (IPL). Kings XI Punjab skipper Ravichandran Ashwin dismissed the Rajasthan Royals opener Jos Buttler through mankading. Mankading is a kind of dismissal witnessed in the game of cricket. Even though it is a legal way of dismissing the batsmen, it is considered as unethical and against the spirit of the game. The name Mankading is derived due to the fact that for the first time Indian bowler Vinoo Mankad had dismissed Bill Brown of Australia, by removing the bails when the latter was away from the crease during India's tour of Australia in 1947. Hence the dismissal is named after the Indian Cricketer Vinoo Mankad. Q. Which Rajasthan Royals cricketer has become the first victim of 'Mankading' in the history of the Indian Premier League (IPL)?